Ordering thin crust pizza instead of a regular crust may be a healthier choice because it's often lower in fat, carbs and sodium. The nutrition in thin crust pizza includes some vitamin and mineral benefits, but you should limit your intake to avoid exceeding the healthy recommendations for saturated fat and calories. Read more: Is Eating Pizza Healthy? 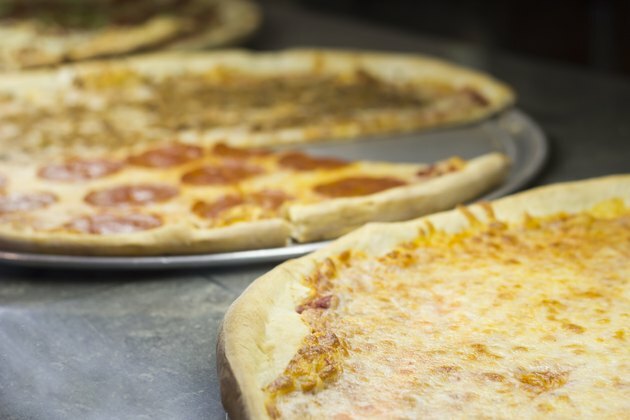 The nutrients in pizza vary according to the restaurant or brand, but generally pizza is among the top sources of calories in the typical American diet. For example, one slice of Pizza Hut 12-inch Thin 'n Crispy Crust cheese pizza contains 209 calories. By comparison, one slice of a 12-inch thick crust cheese pizza increases the calories to 280, according to SELFNutritionData. If you eat a whole 12-inch thin crust cheese pizza, you'll consume 1,736 calories. This represents 87 percent of the daily value (DV) if you're on a 2,000-calorie-per-day diet. The 2015-2020 Dietary Guidelines for Americans recommends a daily caloric intake of 1,600 to 2,400 for adult women and 2,000 to 3,000 for adult men, depending on age and physical activity. Thus portion control is crucial for limiting calorie consumption if you want to control your body weight. A Pizza Hut Thin 'n Crispy Crust cheese pizza has fewer carbohydrates than a thick crust pizza. Carbs in thin crust pizza amount to almost 20 grams, which is 7 percent of your DV. This compares to 30 grams of carbs in a slice of thick crust cheese pizza or 10 percent DV. Pizza is not a particularly good source of fiber, supplying only 1.1 gram in a thin crust slice and 1.7 grams in a thick crust slice. A slice of Pizza Hut Thin 'n Crispy Crust pizza has 9.7 grams of total fat — 15 percent DV — including 4.8 grams of saturated fat. According to the 2015-2020 Dietary Guidelines for Americans, adults should limit their intake of saturated fat to no more than 10 percent of their total calories per day. If your toppings include full-fat cheese, pepperoni or sausage, you'll add even more saturated fat. Toppings with less saturated fat include low-fat cheese, such as feta or mozzarella, and vegetables such as tomatoes, peppers, mushrooms, spinach, basil and artichoke. Read more: How Much Saturated Fat Should You Have Per Day? Pizza has some nutritional benefits. For example, each slice of Pizza Hut Thin 'n Crispy Crust cheese pizza provides 10.6 grams of protein, which is 21 percent DV. A slice of cheese pizza also supplies B vitamins, including 10 percent DV for thiamin, niacin and vitamin B12, and 11 percent for riboflavin. The B vitamins are essential to help maintain normal physiologic and metabolic functions in your body. In addition, thin crust cheese pizza is a good source of phosphorus and selenium with 22 and 23 percent DV, respectively. Phosphorus is important for your bones and energy production. Selenium is an antioxidant that helps with thyroid and immune function. Pizza also contains 10 percent DV of manganese, 9 percent DV of zinc and 19 percent DV of calcium. Calcium is important for nerve transmission, blood pressure regulation and muscle function. Pizza Hut Thin 'n Crispy Crust cheese pizza contains 541 milligrams of sodium per slice, which is 23 percent DV. One slice of thick crust cheese pizza has about 26 percent DV. Healthy adults should consume no more than 2,300 milligrams of sodium per day, because an excessively high-sodium diet may contribute to high blood pressure or increased risk of kidney disease and stroke. To reduce the salt content of your pizza, choose a thin crust and order it with a cheese that contains less sodium, such as Swiss, Monterey Jack, ricotta or Parmesan, and fresh tomatoes instead of tomato sauce. Avoid salty toppings such as anchovies, olives and pepperoni. For example, just 2 slices of pepperoni could add 69 milligrams of sodium to each slice of pizza.